This is, of course, the simplified version. It’s very easy to get bogged down by technical terms and jargon in a post such as this. In South Africa, in order to obtain your N3 in welding, you would have to complete a three-year course at a college. Therefore, herewith the simplified version for the average person (like me!). I think that these simplified welding facts are quite interesting! You can weld almost any metal (eg, steel, stainless steel, aluminium, bronze, brass, etc). Usually the two pieces you want to weld together are of the same material. Occasionally you will weld together dissimilar materials but this is unusual as it’s difficult to find a filler that is compatible with both materials. Also, you increase the risk of corrosion. What’s the Difference Between Welding and Brazing? Welding and brazing are very similar, but there are a few differences. Welding is best described as melting two pieces of metal together. Any gaps are filled up with the filler material from the welding rod or wire. Brazing is more like gluing two pieces together with the melted filler material. In this article, we’re focusing on welding. The four types of welding go by the common names of stick welding, mig welding, tig welding and oxy-acetylene welding. Stick Welding – This is the most common type of welding and the kind most people are aware of. This type of welding uses welding rods that look a bit like giant sparklers. Mig Welding – Mig welding uses a roll of wire that feeds through the centre of a welding gun. it generally uses a shielding gas to keep oxygen away from the weld. For the shielding gas, you can use either argon, or carbon dioxide, or a mixture of the two. Tig Welding – Tig welding uses a tungsten electrode to create a small electrical flame that melts the base material (ie the parts you are welding together), along with a filler material to fuse the parts together. The shielding gas used in this case is either argon or an argon/carbon dioxide mix. For this type of welding, you cannot use only carbon dioxide as the shielding gas. Oxy-Acetylene – Oxy-acetylene welding is useful because it doesn’t require electricity. This is the type of welding that is usually used for car exhausts as it is less likely to burn out the car’s electrics. The acetylene combusts at an extremely high heat, with the help of the oxygen. Stick Welding – Stick welding can take place indoors or outdoors as there is no shielding gas that can be blown away by the wind. The coating on the rods, the flux, protects the weld from oxygen which would create air pockets. However, this type of welding heats up the material significantly, and there is hot slag, flux and sparks to contend with. The flux must be chipped off the weld on completion and these chips of flux can burn you if you chip them off while the piece you are working on is still too hot. Yes, you read right – RADIOACTIVE! Tig Welding – With tig welding, you require different electrodes for the different materials you wish to weld. Most of these electrodes contain a small percentage of a radioactive substance mixed with tungsten. This type of welding can therefore be the most dangerous as you can suffer severe radiation burns if you do not wear the proper protective equipment. Even tig welding for only a few minutes without protective gear will result in burns similar in effect to extremely bad sunburn. Oxy-Acetylene – With Oxy-Acetylene welding the material becomes very hot and there are sparks and hot slag. The weld can become explosive where it meets oxygenated material (ie, rust). However, as mentioned above, this can be a good choice where you don’t wish to use electricity. In conclusion, oxy-acetlyene and stick welding cause the material to heat up much more and over a much wider area. Mig and tig welding allows for more concentrated heating so the material won’t be as hot further away from the weld. 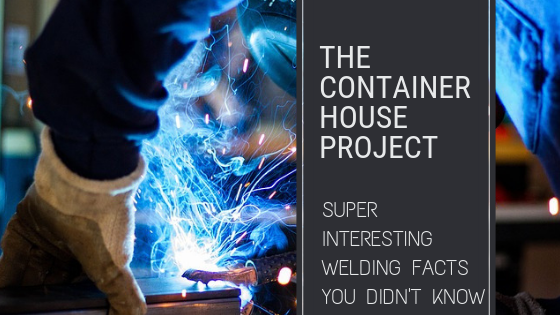 What Type of Welding Will be Used on The Container House Project? For the majority of the welding on the container house project, Kevin will be using flux core wire in a mig welder. He finds mig welding the easiest, but has to compensate for not being able to use a shielding gas while welding outside. Kevin will be using mig welding for approximately 70% of the welds required. For about 20% of the welds he will use the stick welding method. He will use this method where he wishes to obtain a deeper penetration on the weld to increase the strength of the weld. For the final 10% of the welds, Kevin will use the tig method. He will use this method where neatness is a priority. When we get to that point of the project, we’ll be sure to post some photos! Previous post: Building Plans Approved! What’s Next? Wow so interesting! I never realised there were so many different types of welding and I love that blue, magical photo! Yes, I don’t know how Kevin remembers all the details! Wow, who knew there were so many different ways to weld?! It’s a real learning experience, this Container House Project! It’s a learning experience for me too!